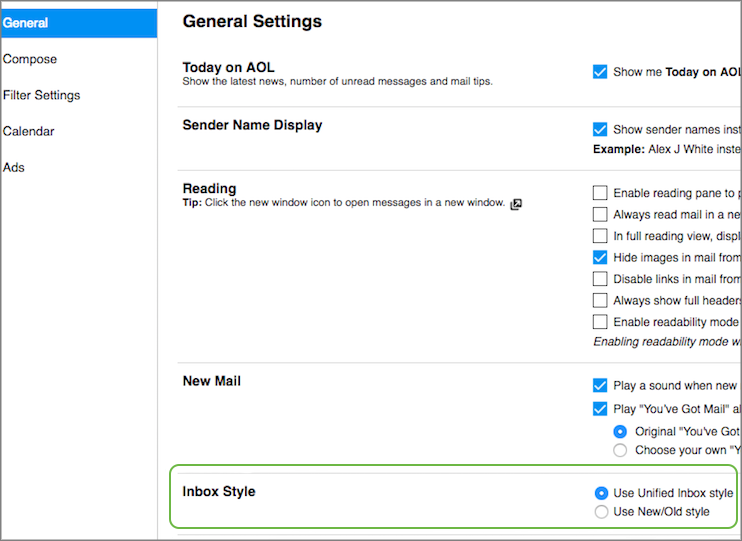 Learn how to switch your Inbox from the New/Old Inbox style to the Unified Inbox style. The Unified Inbox displays all your emails in one place, as opposed to separate New Mail and Old Mail folders. Emails in the Unified Inbox are listed by date, with the latest message on top. 1. Go to your AOL Mail inbox. 2. Click Options | Mail Settings. 3. Click the General tab, if not already there. 4. Next to "Inbox Style," select Use Unified Inbox style or Use New/Old style.